SPRUCE CREEK, FL - The second annual Balloon Fest was held this weekend at New Smyrna Beach Airport (KEVB), a few miles due south east of Spruce Creek (7FL6). Admission was free to the public and almost twenty thousand people were in attendance. The fest started last year as a one-day event that drew roughly 10,000 people. This year's event, extended to three days, and featured 25 hot-air balloons, helicopters, airplanes and live music. 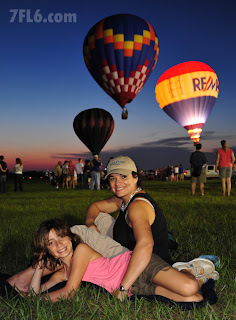 Attendees were able to experience serene flights in a balloon at the hands of experienced balloonists from the area. The Spruce Creek Gaggle made an appearance as well as the Mavericks precision formation flying team, all residents of the Spruce Creek Fly-In. Tim Plunkett's Red Baron, a Fokker Dr. 1 Triplane replica was the star of the static display, which included a number of civilian and military aircraft. Originally planned for January 8-10, the event had to be cancelled due to record-breaking cold temperatures and it was postponed to this last weekend, May 21-23.The wait was rewarded with clear skies and balmy temperatures.